We were excited to see that our print tops caught the attention of the costume design team for these award-winning productions. Uniform Advantage (UA), a multi-channel retailer of medical scrubs for healthcare and hospitality industries makes an appearance on the big screen. 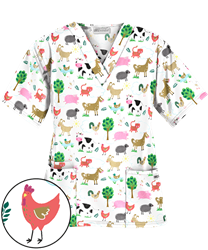 In the final chapter of the “Pitch Perfect” trilogy set to be released in theaters December 22nd Uniform Advantage On the Farm White Print Scrub Top is worn by main star Brittany Snow. A second UA scrub top was featured on the hit ABC show “Designated Survivor.” In the winter finale, that aired December 13th, the president Tom Kirkman himself was walking through the hospital and the nurse escorting him was sporting a festive Dickies EDS Beary Christmas top. “We were excited to see that our print tops caught the attention of the costume design team for these award-winning productions. Although the tops are no longer available to shop we are glad they will live on in these appearances,” said Uniform Advantage’s VP of Marketing, Lori Nadeau-Dunlap. UA is constantly designing a wide variety of fresh and stylish printed designs for their exclusive collections. Uniform Advantage is the number one place for scrubs and uniform needs. To see the scrub selection or learn more information about Uniform Advantage please visit http://www.uniformadvantage.com/. Uniform Advantage has represented style, quality and, above all, customer satisfaction for more than 30 years. As the first division of UA Brands, the chain was launched with a single South Florida store in 1985. Today, the company operates 29 retail locations in key markets across the U.S.; e-commerce and print catalog divisions; plus, designs and manufactures its own proprietary healthcare apparel lines. The company’s corporate office is based in Fort Lauderdale, Florida with a distribution center near Atlanta, Georgia. Learn more at http://www.UniformAdvantage.com or by calling 800-283-8708.